We are a cult ice-cream parlor in which all products are homemade and in which we maintain tastes, recipes and traditional drinks from the past and transmit them from generation to generation. We serve as well sandwiches and are quite renowned for our sausages in Barcelona. The horchatería is the busiest place at Poblenou, an area at the sea which is very popular and also very trendy, with a great history and which was due to its location a center of the most important industry in Spain during the nineteenth and twentieth century. The tigernut milk is produced every day with tigernuts from Alboraya, it does not contain any additives. Neither preservatives nor coloring agents are used, it is not pasteurized and we do not freeze-dry it either. Tigernut milk is produced out of water, tigernuts and sugar; we also have tigernut milk without sugar for those suffering from diabetes. El Tio Che is a meeting point for friends, we look forward to your visit and hope that you will feel welcome. On hot days you can see long queues in front of our shop from far, everybody wants to get something after being on the beach or at work. 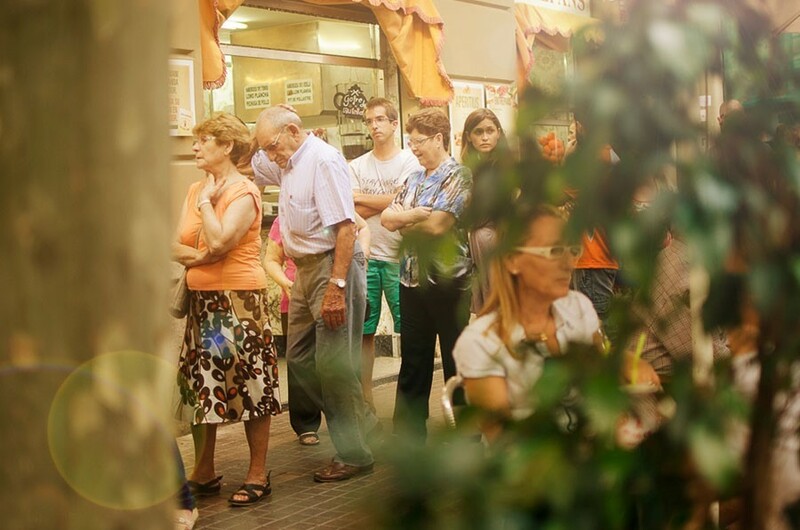 We are quick to serve, so that these queues dissolve in minutes. We serve excellent sandwiches with the best ingredients that have been produced as in our family company. The sandwiches of El Tío Che are famous in Barcelona for the fresh bread, the thick topping and the quality of their ingredients. On Saturdays and Sundays we serve the best vermuts of the neighborhood with mussels, venus clams, cockles, olives and baked potatoes with a garlic sauce that come right out of the oven. In winter we produce turrones made from chocolate truffles and different fillings from our own homemade production. Every year we add new products, we have an exclusive and limited production for Christmas, New Years and Epiphany, even though we have customers everywhere in the world. There is a lot of talk about us in the press. The never-ending work that five generations of producers of tigernut have done is appreciated in the neighborhood, from the young, the neighbors from Barcelona and the steady growing number of travellers. When you visit us, we would appreciate it if you could give us your name, we would like to get to know you and are happy about your visit. El Tio Ché – serving you for over a century!